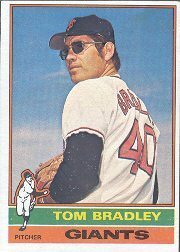 A 1971 article about the White Sox newcomer began by telling about Tom Bradley’s vision without glasses. These days, paraphrasing historians on the ‘net talk of Bradley being legally blind before specs. When Chuck Tanner took over the ChiSox, he toyed with a three-man rotation: Wilbur Wood, Stan Bahnsen and Bradley. How did Bradley survive? Bradley’s humility floored me. He threw six shutouts in 1971, three against the Oakland A’s. Yes, the division-winning team with 101 victories! His simple, humble reply? When I saw the second page of Bradley’s reply, I realized what a grateful guy he was. “I have been truly blessed, having been in baseball 57 of my 64 years. Played L League, Babe Ruth, American Legion, Falls Church High School, F.C.Virginia, Clark Griffith League, 3 years in the VA Valley league. Signed in 1968 after junior year at Maryland. With the Calif. Angels. Played on 5 teams in 1969, culminating in Sept. ’69 call-up. Spent 6 more years in the majors, 1970-75. Finished with Tucson Toros in 1976. Then got into college coaching from 1977 to 2000. One year at St. Mary’s College in Moraga, Calif. (Von Hayes and Tom Candiotti were on the team). 1978 through 1990, head coach at Jax. Univ. in Jax., Florida. Then went to my alma mater, the Univ of Maryland, from 1990 to 2000. Then 10 years as pitching coach, 5 with the Toronto Blue Jays in A ball and five with San Diego Padres in A ball. I am now the pitching coach at Gonzaga College High School in Washington, D.C., where my son Andy is the head coach. Somewhat of a role reversal, as he is now my boss. I have been happily married for 36-1/2 years to Kathy Bradley. We have a daughter Alix Bradley Simmons, who works for Macy’s as a buyer in San Antonio, Texas.